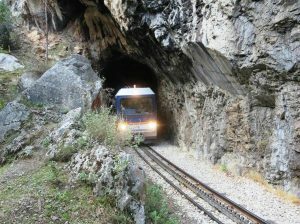 The cog railway, “Odontotos” begins from the railway station of the seaside town of Diakopto and follows the Vouraikos gorge. The one hour journey and 22 km distance ends up to the city of Kalavrita at an altitude of 750m. Passing through 49 bridges and by traversing beautiful landscapes, it hasn’t been unfairly characterized as “ A remarkable work of art”, in facilities which are “Historical monuments”. 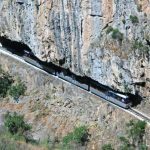 makes this cog railway being the narrowest in the world. You can find more information in here. 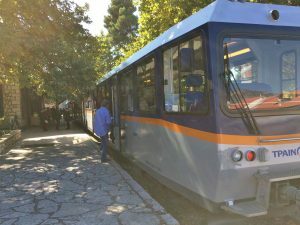 *If you are going to visit Kalavrita and the cog railway in high season ( for example Christmas, New Years Eve) you should take your tickets in advance. 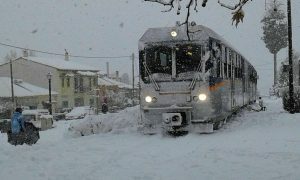 You can find more information, contacting the travel agency kmt.gr. *For your better convenience we can purchase for you the tickets. Necessary condition the lump sum payment of the tickets and your written permission. (e-mail, fax). 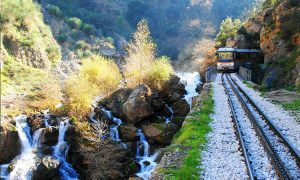 Share the post "Cog railway Kalavrita Diakopto"